Over the past 20 years, GLM Products, Inc. has developed an extensive line of innovative and cost-effective marine engine and drive parts. With over 4,000 line items available, including many that are only available from GLM, dealers and marine mechanics are able to offer their customers a high-quality alternative to OEM parts. The GLM line is always growing. Recent additions include an extensive line of aluminum and cast iron exhaust manifold systems that offer improved performance and consumer-friendly pricing. �The economy has caused consumers to look for value and GLM is in a perfect position to offer marine businesses and consumers a better product and value,� said Ed Fleet, GLM national sales manager. From GLM�s humble start, when it offered just a few catalog pages of products, each additional year has led to growth in its comprehensive product line. Today, GLM offers 4,000 products in five, soon to be six, GLM product catalogs. MerCruiser, Mercury/Mariner, OMC, Johnson/Evinrude and the Manifold catalogs, along with an upcoming Yamaha catalog, cover a large variety of popular early and late-model engine and drive parts. �Whether you need a drive unit, manifold, drive shaft, seal, piston or just an impeller, dealers and distributors can be assured that with GLM, they are offering their boating customers high-quality, price-competitive products,� Fleet said. GLM has significantly expanded its line by using the most current technology in manufacturing, design and materials. The company applies technology to new materials, designs and manufacturing in order to deliver improvements on original designs of current parts, innovative new alternative products and products no longer available from OEM manufacturers. Recently, the introduction of the GLM cast iron and aluminum exhaust manifold line once again showed the benefits that the company offers. These manifolds are all lost-foam cast and are internally tuned for performance and fuel efficiency. And, they are exact replacements for OEM and other brands. In addition, GLM�s exact replacement manifolds are also produced in aluminum. This reduces weight, improves performance and fuel efficiency and, of course, offers dealers and distributors, and their boating customers, a cost-effective alternative to competing aluminum manifolds on the market. 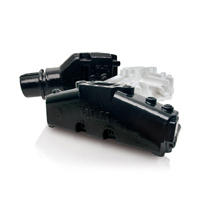 The GLM manifold line, like all GLM products, offers quality, availability and value. Quality and value are two very important aspects during a period of economic challenges. As everyone knows, the current economic downturn has negatively impacted the boating industry. However, there are bright spots within any industry during challenging economic times. Boating is still alive in the U.S. and around the world, and it is a way of life for many people. Boaters may not buy as many new boats this year as in recent years, but they will continue to go boating in their current boat. The more an aging boat is used, the more it requires repair and maintenance. This means that even though boating activities may be down, the repair and maintenance business certainly will increase. In the current economic environment, boaters will be looking for better value. GLM aftermarket products deliver by offering a high-quality, costeffective alternative that reduces costs and helps boaters continue enjoying the boating lifestyle. Lower fuel prices certainly will help reduce costs this season, and helping boaters save money will improve results for distributors and dealers as well. Dealers and distributors need to be prepared to take advantage of one of the best opportunities in the boating industry this season: boating products offered by GLM Products, Inc.